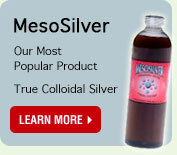 We make metal colloids which are true colloidal minerals. In this context, the term colloid means particles. We use a proprietary process that produces particles which are just a few times the diameter of the atoms themselves. By maximizing the particle surface area of these colloidal particles our products provide unparalleled effectiveness. Produced by the Mesoprocess, the resulting colloids are true colloids, meaning the metal content is in the form of metallic colloidal particles.